Cured Pork | Look at me updating my little website! to grab all of them. It’s free software, and the source code is available from their website (support->licenses), although they seem to be running on a free/paid version system of binaries, with more features and support available for the paid version. If you’re not keen on compiling a bunch of UNIX software under Windows, it’s probably worth the 49 Eur. to get the paid version. The MSI-GE620 laptop is a pretty good laptop albeit with a few small annoyances. One of them is a row of buttons above the normal keyboard used for certain laptop functions, such as ejecting the CD-Rom or automatically switching monitor modes. Unfortunately Linux doesn’t recognize these keys out of the box, MSI doesn’t provide any support or linux drivers for this keypanel, and to make matters worse, there is no hardware eject button on the optical drive. 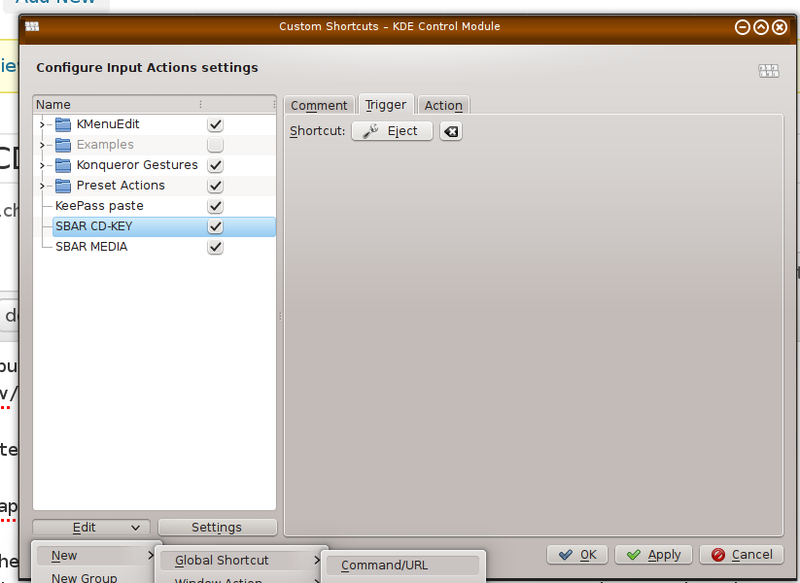 After a few hours of some googling I managed to come up with a pretty nice workaround in KDE. only the eject button and the media (film) button are working. No idea what it will take to get the other buttons working. I am not responsible for what you do to your system. Please read up on the commands/files I am using if you are not completely familiar with them. I’ll give some links to the docs I used to figure all this out at the end of the post. 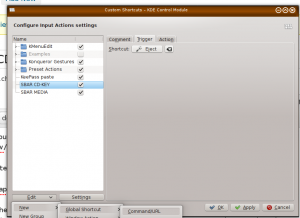 In KDE I opened up the “custom shortcuts”, then clicked ‘edit’ and ‘New>Global Shortcut>Command/URL’ and then set up a custom shortcut to the eject command, pressing the now-mapped eject key for the keyboard shortcut. Cured Pork · Look at me updating my little website!